While the Ithaca Journal seems to have finished with local opinion about the election on Saturday, there's still a lot of detail about election mechanics in today's paper. The number of absentee ballots, military ballots, and ballots for citizens living outside of the country have all increased this year. People can still pick up absentee ballots at the Board of Elections office (map) today until 4:30pm. The ballot must be postmarked today or delivered by tomorrow. There's also a listing of Election Day Dinners, including one at the Dryden United Methodist Church (map) from 5:00pm to 7:00pm. On the opinion page, County Legislator Michael Koplinka-Loehr takes a look at the county budget, while Gannett columnist Jay Gallagher examines Republicans' shrinking hopes in state Assembly races. Dryden Village Hall - 16 South Street, Dryden (map). Dryden Baptist Chapel - 138 Virgil Road, Dryden (map). Dryden Town Hall - 65 East Main Street, Dryden (map). Polls are open from 6:00am to 9:00pm. If you're not sure what district you're in, see the district map (597KB PDF). There's lots of news about today's election in the Journal, including general instructions for voting and a list of election-day dinners including the one at the Dryden United Methodist Church. The Journal takes a look at how Tompkins County residents have participated with their pocketbooks, as the direction of New York's electoral votes are pretty well decided. The article quotes County Legislator Martha Robertson several times, and I earlier reported on a fund-raiser for Kerry at her home. In other local news, former Dryden bookkeeper Liva Brong was sentenced to $701 in restitution and five years probation for forgery of town checks. There's also an article on the impact of TCAT's reorganization on employee pay and benefits. Elia Kacapyr reports that Tompkins County's economy did better in September. On the opinion page, the Journal's editorial discusses Ithaca schools redistricting. Sue Hoyte of the Village of Freeville writes to complain that "I also cannot believe that the flag emblem is going to be removed" from City of Ithaca police uniforms. I just went to vote at the Varna Community Center, with lots of other people. They had the usual lovely display with a model voting machine, sample ballot, and instructions. 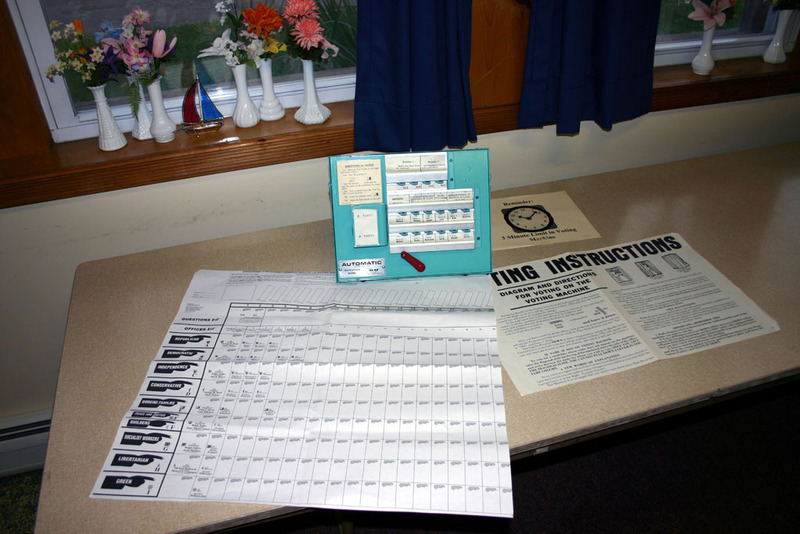 Sample ballot, instructions, and model voting machine. It was pretty busy already - I was about voter 115 so far for the day. People were lining up to sign in and then use the voting machine. It looks like it'll be a busy day at the polling places. Get out there and make your voice heard! While Town Hall is occupied with voting machines right now, on Thursday night it will be the scene of a budget hearing. [Update: No, it won't be. The budget hearing has moved to the Village Hall (map).] With all the election work I've been doing, I haven't managed to cover last Monday's budget workshop (the four hours of it I saw, anyway) or the preliminary budget that it's produced. The tentative budget was the supervisor's budget before the workshop, and the preliminary budget is the budget going in to the public hearing. For more detail on the tentative budget and the changes it reflected, see my earlier stories on the top-level view, the body of the town budget, and the special districts. The workshop was fairly quiet. The Town Justices came to ask for additional funding for metal detection equipment, including a wand and a walk-through detector, as well as a salary increase to reflect their increased caseload, especially in around-the-clock arraignments and a growing small claims load. 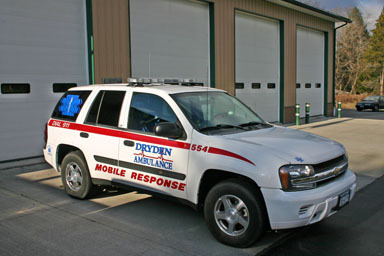 The Varna and Dryden fire companies had representatives there, as did Dryden Ambulance. The new Recreation Coordinator, Jennifer Staton, was also there, and bookkeeper Dawn Bogdan helped the board understand the often incomprehensible printouts. The fire departments seemed happy about the prospect of two-year contracts, bringing their negotiations out of the election cycle. One-time expenditures for the fire companies are down this year. Varna has one piece of software that needs upgrading, and is requesting a thermal imaging camera next year. 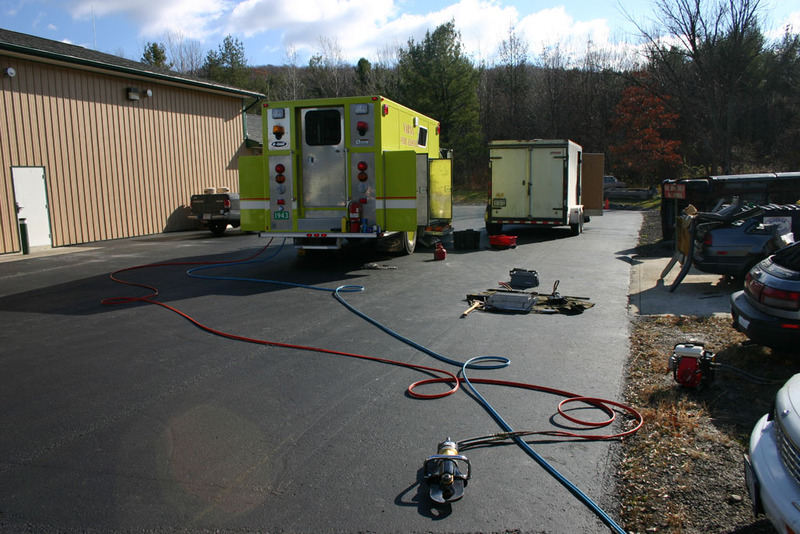 Neptune Hose Company is facing the prospect of needing an addition to house equipment, as replacement vehicles are larger than the vehicles whose places they take. There were also concerns about the local cost of the county's upcoming emergency communications system. Fuel costs have increased significantly. Finally, Etna Fire Company hadn't put in a budget (and hasn't been paid so far this year), so they were budgeted the same as last year. Clayton Bronson, Director of Ambulance Operations at Dryden Ambulance, was excited about their use of a floating 'chase car' that stays in the western half of the town from 7am to 3pm Monday to Friday, providing first-responder support. The EMTs can reach the scene faster than an ambulance, and can provide immediate help while waiting for the ambulance to arrive. Councilman Marty Christofferson walked the board through wage levels, proposing a 3% cost-of-living increase but proposing higher salaries for some employees whose wages are substantially below those of similar surrounding towns, notably the Town Clerk and Zoning Officer, as well as lower increases for those who have done better recently. The board held off on increases for the Town Justices. There was also some discussion of Town Attorney Mahlon Perkins' request for a rate increase, but board members held off until they could get more details about the current arrangement. Some of the discussion explained particular line items. Dog Surplus, for instance, is what's left of the county's share of dog license fees after the county has paid out to owners of livestock damaged by dogs in the town. Project Impact is about disaster prevention. Councilman Marty Christofferson seemed frustrated by the opacity of the budget process, and also by the town's budgeting money with the understanding that it might not be spent. The appropriation for Personal Services for the Town Justices (which includes their staff) increased from $102,643 to $107,882. The appropriation for Personal Services for the Receiver of Taxes and Assessment increased from $26,562 to $29,824. The appropriation for Personnel decreased from $30,600 to $20,600. The appropriation for contractual expenditures for buildings decreased from $38,000 to $34,000. Contractual expenditures for Dryden Lake Park increased from $2000 to $9,500. Personal services for Youth Recreation, money for interns, went from $6000 to zero. Contractual expenditures for Planning fell from $6500 to $4000. There don't seem to be any changes in the special district budgets, including fire, ambulance, lighting, water, and sewer, though Dawn Bogdan assures me that the consistent zeros for special assessments are a bug in the budget program. It sounds like she's working on replacing that program soon anyway, and hopefully that will yield more readable budget information. 73% of registered voters turned out across Dryden yesterday, with 10 of 11 polls reporting 69% or greater turnout. In Dryden, John Kerry won 3398-2597, while congressional challenger Jeff Miller defeated incumbent Sherwood Boehlert 2556-2444. Neither of those results seem to have held up for the rest of the country or the congressional district, unfortunately. Town Justice Joseph Valentinelli won re-election with 3661 votes. In other unopposed races, Assemblywoman Barbara Lifton won 3685 votes here, while State Senator Jim Seward won 3068 votes in Dryden. In the US Senate race, incumbent Charles Schumer won in Dryden with 3390 votes to Republican Howard Mills' 1712 and Conservative Marilyn O'Grady's 212, and won the race overall. The proposal to have Off-Track Betting (OTB) in Tompkins County was defeated by 2475-2138 in Dryden and 13,593 to 8,305 in the county. The county Board of Elections has published unofficial results for all races in the county, including district-by-district breakdowns. Much of the Journal's coverage today is about yesterday's elections. They lead their local coverage with a piece on the defeat of the OTB referendum, which quotes Bruce Drowne of Dryden as supporting the measure. There's also an article on Sherwood Boehlert's re-election to Congress. The print edition includes results for Tompkins County, though you can find those (and more detail) here. There's a mention of tomorrow night's Dryden budget hearing, at 7:00pm at the Town Hall [Update: Moved to the Village Hall (map)], and also postings looking for Zoning Board of Appeals and Conservation Board applicants. Today's paper also includes a seasonal forecast for central New York that predicts a cold and stormy winter. The Journal's editorial calls for "an end to the division" of the country. Yesterday was a fairly quiet day in Dryden. The county legislature approved requiring apprenticeship programs of its contractors by a 9-5 vote. County Legislator Michael Lane is quoted at the end of the article supporting the measure, though they don't give a vote listing. On Veterans Day, November 11th at 11:00 am, there will be a number of ceremonies honoring veterans, including one on the Dryden Village Green sponsored by Dryden Veterans Memorial Home. A Freeville woman faces DWI charges after a one-car accident on Dryden Road near NYSEG. On the opinion page, two Dryden residents share their comments. Suzanne Bury of Dryden writes of her concerns with the flu shot shortage. Charlie Hart of Freeville writes to suggest that manufacturing in the United States is ending: "The smart move is to forget about manufacturing and send your kids to school to learn something else -- and maybe this county would have other jobs besides retail." This morning's Ithaca Journal reports that the county will be distributing flu shots at the National Guard Armory on Hanshaw Road (map). The county will be screening people to make sure they live in Tompkins County, for medical reasons not to get the vaccine, and to ensure that they are members of one of the Centers for Disease Control's priority groups, listed in the article. Tompkins County has been given 350 doses by the state; it's not clear if those are the doses being administered here. The county is reconsidering funding for an expanded jail after finding that the design costs alone would be $600,000 next year, roughly double the price for this year. The county had approved moving forward with the design in large part to soothe the New York State Board of Corrections, which continually insists on a larger jail than even the jail's local supporters seem to want. County Legislator Martha Robertson is quoted as saying "This is not good public policy and this is a waste of money... Just because we once had a jail with 107 people, it is not worth building a jail with 136 beds." Sheriff Peter Meskill said that if the county doesn't want to build the jail, they should stop the project in the next ten days and budget for more boarding out of prisoners. There's also a piece on the state legislature considering more standardized salaries. While I'm happy to see the end of stipends, or 'lulus', I'm not thrilled by the prospect of a general raise for a body whose members don't even have to be present to vote. I found another Upstate-focused blog that I think is worth mentioning, though I find its obsession with taxes and business-friendliness painfully narrow. Upstateblog.net is a project of the Public Policy Institute of New York, which is itself affiliated with The Business Council of New York State. It may be a "non-partisan" site, but it clearly has a perspective. Apart from the perspective, I love the way that it scours upstate papers for interesting news. Despite the "state briefs" in most papers, there isn't usually a lot of coverage of what's happening across the state on things like budgets, elections to state office, and a variety of other indicators that make stronger points when you see them as a group rather than as individual stories. A lot of Dryden residents seem to read both the Cortland Standard and the Ithaca Journal, which gives them two-county coverage, and the Syracuse Post-Standard is available, but it seems unusual for people here to read the Auburn, Corning, Elmira, or Binghamton papers. Upstateblog.net covers a much wider range than that, from Buffalo to Poughkeepsie and sometimes New York. At the same time, though, while Upstateblog.net calls itself "A Blog of Ideas and Comments," those ideas and comments flow only one way - from the writer to the reader. There's no room for reader comments here, which is disappointing. (Managing comments is a huge nuisance, largely because of spammers, but it's been well worth the trouble for me.) There are also no archives and no way to link to individual stories that I can find. It's worth noting one myth here: For years, more tax dollars have flowed from Downstate to Upstate, and not the other way around. As our recent report pointed out, Upstate's extra tax burden (up to $6 billion more than an average state pays) is due mainly to excess local government employment and Medicaid, in that order of priority. It's worth checking out, and possibly emulating from other perspectives. This morning's Ithaca Journal reports on Tompkins County Kitchen Cupboard programs, including one in Dryden, looking at where they get their food and funding and the services they provide. On the opinion page, there's a Laurel from Laurie Schutt of Ithaca that thanks "local supporters for her efforts in the Susan G. Komen Foundation three-day breast cancer walk," including Dryden Food Mart and the Dryden community. Journal Managing Editor Bruce Estes (a Dryden resident) writes of election-night complications for the paper, and notes once again the 3398-2597 Kerry victory over Bush in the Town of Dryden. I started this site one year ago. I was depressed about an election then, and I am depressed about an election now. A lot has improved in the last year, though, and this site has helped me find better things. Looking over the Village of Dryden in fall. I'll be indulging a bit this week in looking over things I've learned, events that tell particularly interesting stories, and looking at where I'd like this site to accomplish. Dryden has proven far richer than I expected. When I started, I wondered if one story every day was realistic. As it's turned out, there have been many days where I've had four or five, and I feel like I'm just barely scratching the surface of what happens here. It may not be obvious driving around Dryden or reading the paper, but there are all kinds of activity going on in all parts of the town. Update: I've also written about this at my blog for work. I keep hoping to see more people do something similar with their community. 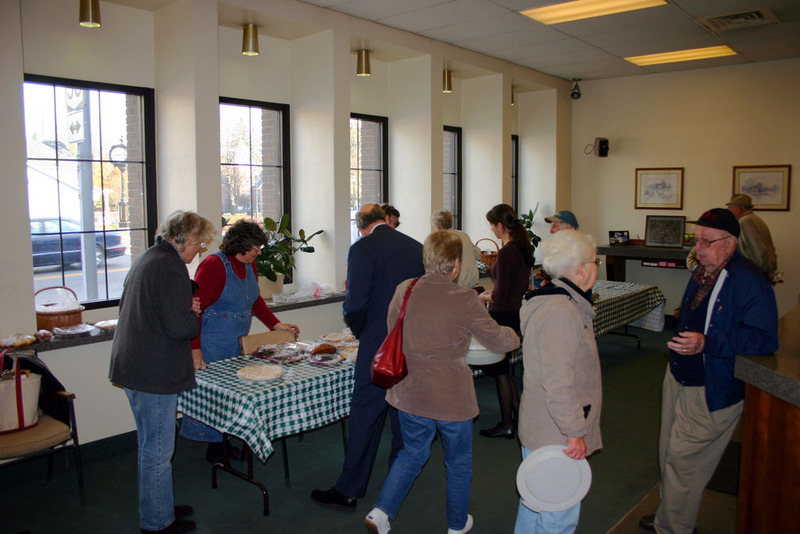 I went to the Dryden Town Historical Society's bake sale at around 9am this morning, and it's a good thing I got there early, as the pies, breads, and brownies were leaving quickly. A busy bake sale in the First National Bank of Dryden's lobby. The pumpkin bread I've had so far is great, and I suspect the same will be true of the banana bread, pies, and brownies I bought. Thursday's town budget meeting made very few changes to the budget beyond those made at the much longer budget workshop, but the few changes were significant, and there was a lot of conversation about some potentially major changes to be discussed in future years. Sadly, there was almost no one there from the public. 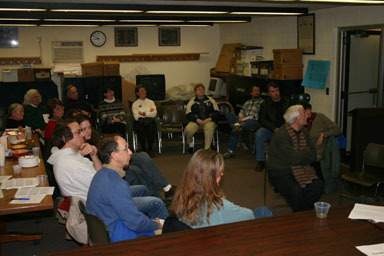 WHCU sent a reporter, I was there, and the rest were town board members and town employees. The budget only changed in three places. The most minor one was that a line in the recreation budget increased from $8000 to $10,000, as had been agreed at the previous workshop but not reflected in the budget. The other two changes applied to the Fire District. Councilman Chris Michaels asked that there be funding for an emergency services coordinator of some kind, someone who understood fire and rescue services to help board members interpret and handle data and requests from the fire companies. Councilman Steve Stelick noted that the idea had the support of the fire chiefs. There was some discussion about whether this needed to be a permanent (if part-time) position, or whether a consultant approach would work. In the end, the board decided to put $25,000 in the fire budget for this, $20,000 of it likely to be an annual expense and $5,000 of it for getting started. The board also discussed buying $8500 of ice water rescue equipment, for use in the town's many ponds and creeks. There was some discussion I didn't understand about a proposal (they didn't say from whom) to put this appropriation under recreation, but the board decided to put it into the fire district budget, as the equipment would be stored at and used by Neptune Hose Company. Councilman Stelick, with the support of Councilman Marty Christofferson suggested reducing the money for the fire audits ($40,000 unspent this year) and applying some of that to the new expenditures, but the audit money stayed with support from Councilman Michaels. Michaels noted that the board might not spend the money later, but that "would be a different issue". Highway Superintendent Jack Bush and Environmental Planner Debbie Gross were also there to discuss their budgets, but no changes were made. There were a number of other discussions which didn't affect this year's budget, but which will drive conversations over the next year or so. Councilman Christofferson asked about the state of the town's reserve funds, and what they might be able to spend on a new Town Hall. Based on preliminary numbers, Bookkeeper Dawn Bogdan suggested that $2 million might be reasonable. As some of that money is dedicated to the new Town Hall, the board can make appropriations to pay for preliminary work out of those funds rather than the general budget. Councilman Michaels asked for some kind of fiscal statement. Councilman Hattery asked that the town move a lot of the items currently under Highway Townwide to Highway Outside (the villages), reflecting that the town spends nearly all of these funds outside of the villages. There was some discussion of how the town shares equipment with the villages, and I asked how this would change things if new villages were added, but overall it sounds like it wouldn't have an effect on taxes, as the state requires sales tax revenue to go first to the Outside parts of the budget. I need to do more research on this. The board will re-examine it next year. Councilman Michaels raised the question of the Town Supervisor's salary, pointing out that "$15,000 limits the office to the retired or the independently wealthy," and wanted to see that raised so it didn't have such a limiting effect on possible candidates. Councilman Hattery noted that the Town of Ithaca pays two salaries, one for the elected official side of the job and one for the administrative part of the job, and the Town Board can separate the two jobs if necessary. Councilman Christofferson said that the town's survey of salaries in other towns showed the Supervisor's pay was all over. Michaels wants to see the town discuss this early next year, before people have to decide if they want to run. There was also discussion of making the Supervisor's job a four-year term, which would require a referendum, but no action was taken. At the end of the hearing, the board approved the budget. There was also brief mention of a complaint about parking problems during Tuesday's election at the Varna Community Center, which has two districts voting, and of a request from the Ellis Hollow Community Center that will be considered at the next meeting. Organizations like Dryden Veterans Memorial Home, Kiwanis, Sertoma, Grange, senior citizens groups, and the many others I'm sure I've forgotten to mention. I'm doing mostly all right with the Dryden Town Historical Society, but even there I've been too busy to cover everything. Community Centers throughout the town. I think I cover Varna adequately, and I've covered Etna occasionally, but there's a lot more to do with those, Bethel Grove, and Ellis Hollow. School activities. This is vastly complicated by the split in town between the Dryden Central School District and the Ithaca City School District, but I'm doing what I can to cover both. Recreation. I've covered a few things, like the concert series over the summer, but it's only a small share. Churches. I had a great time covering the Etna Community Church's 200th anniversary celebrations, but haven't been able to do much otherwise. Agriculture. I've covered this to some extent through Planning Board meetings, but it's not a great way to get a broad perspective on farming in Dryden or to look close up at the many interesting things going on in the town's farms. Tompkins-Cortland Community College. It's kind of a community-within-a-community, one I've barely covered. 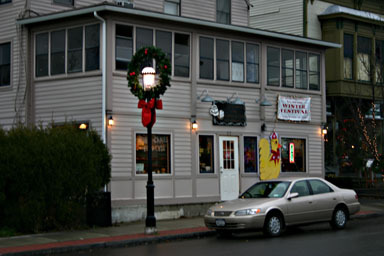 Cornell's activity within the town. Cornell is a key foundation for Dryden's economic base, and owns a lot of land, but they're pretty quiet out here. I'd like to know more. Don't get me wrong - I'm very happy with what I've managed to cover, and I've even enjoyed most of it. I figure this list of what's missing is worth posting for two groups of people. Some people see Living in Dryden and can't believe there's that much to write about a small place. They should know that there's a whole more that I don't have time to write. The second group sees Living in Dryden and knows that there's something they'd like to see covered that isn't there. I'd like those folks to know that I'm at least thinking of them, and that I'd love to do more if there were extra hours in the day. If there's anything I've missed - entirely likely - let me know in the comments. There isn't much specifically about Dryden today in the Ithaca Journal, though there are a few articles which come close to the town's borders. There's a picture of McLean resident Margie Albern and her grandchildren in an article on the Veterans Day parade in Ithaca, and there was a fatal accident on Peruville Road (34B) in Lansing. There's also another mention of the county budget being available for examination. Update: Oops. I forgot to include this burglary from a storage facility on Dryden Road. How much time are you willing to give? Volunteering is definitely alive and well in Dryden, with lots of people donating their time and efforts to a wide range of projects. Eagle Scout projects, church groups, fundraisers, community centers, school projects, sports programs, service organizations, political parties, and emergency services all help make Dryden a richer place. Volunteer organizations are facing some large challenges, though, especially in emergency services where more and more training is necessary. Keeping volunteerism alive requires a critical mass of people to participate so that a core group of active volunteers isn't crushed under the load. A large number of town and county government decisions are made by people who are close to being volunteers, but paid somewhat for their public service. The number of hours put in for the dollars received doesn't make much sense as a paying job, and a sense of public service is definitely necessary to explain the hard work they put into their jobs. I hope that the time I've put into this site has reduced the amount of time necessary for other people to get up to speed on the issues if they want to come to town meetings. It's still a challenge to figure out what our governments are doing, and it definitely takes time to participate by attending meetings. I worry that complaints and regulations are the primary motivators that bring people to meetings with their community government. I'm glad that something brings them at all, but I'd like to see more people coming with new ideas. Even strictly fun activities, where attendees enjoy the time, learn something new, or watch their children having a good time, require people to take time out of their schedules. It's often easier to decide to do that, but schedule-juggling is still an important factor in how many people actually attend events. The town is also big enough that driving distances matter to people. It doesn't help that the southern side of town's geography makes road patterns complicated. Getting from Bethel Grove to McLean or even the Village of Dryden is not a simple proposition. It's certainly doable, but it isn't quick, and travel time contributes significantly to people's decisions about how to spend their time, whether they're going to help out or to have fun. 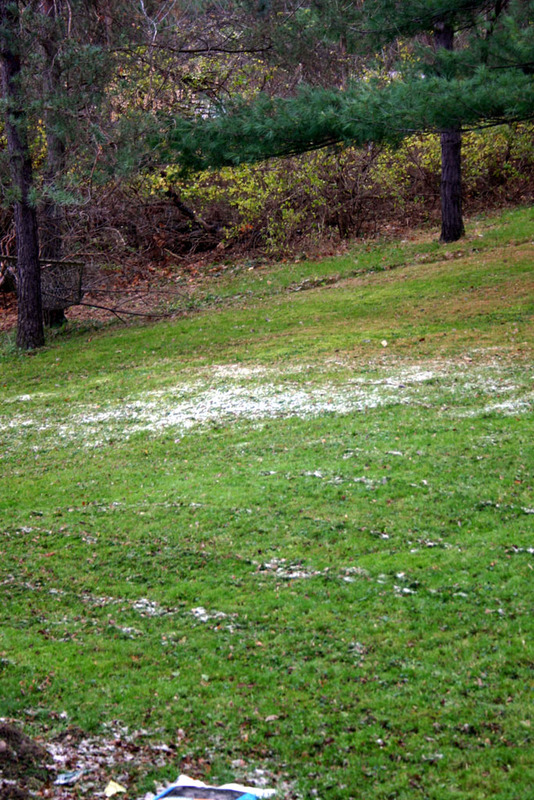 It's not much snow, and it's gone already, but it's the first morning I've seen it since spring. 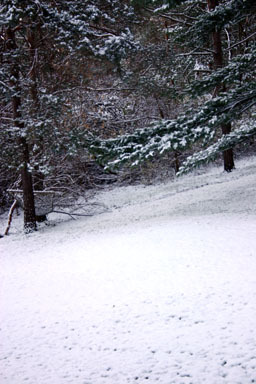 I'm glad I finished my mowing and raking yesterday. The Dryden Democrats will be hosting a gathering this Wednesday night, November 10th, at 7:30pm at the Dryden Town Hall, 65 East Main Street, Dryden (map). Democrats and independents are welcome. We'll be taking a look at what worked for Democrats locally and what we can do to build on that, as well as considering the national situation. This morning's Ithaca Journal reports that Dryden Central School District got good marks in an audit, and that the board is looking at academic intervention support and energy management. The Journal also takes a look at TC3's alcohol awareness programs as part of a look at local colleges' efforts to fight binge drinking. The Tompkins County Legislature will be having a public hearing on the county budget tonight, examining a budget where capital costs have driven a 6.27% levy increase. The hearing will be at 7:00pm at Ithaca Town Hall (map). If Dryden's results last week are any sign, the New York State Republican Party is right to be looking at its own future. "Now that the election is over perhaps 'The Boss' can go back to writing songs instead of trying to write history. Hollywood can go back to providing entertainment instead of embarrassment. The mainstream media can go back to demonstrating dignity instead of bigotry and maybe, just maybe, America can go back to being America." 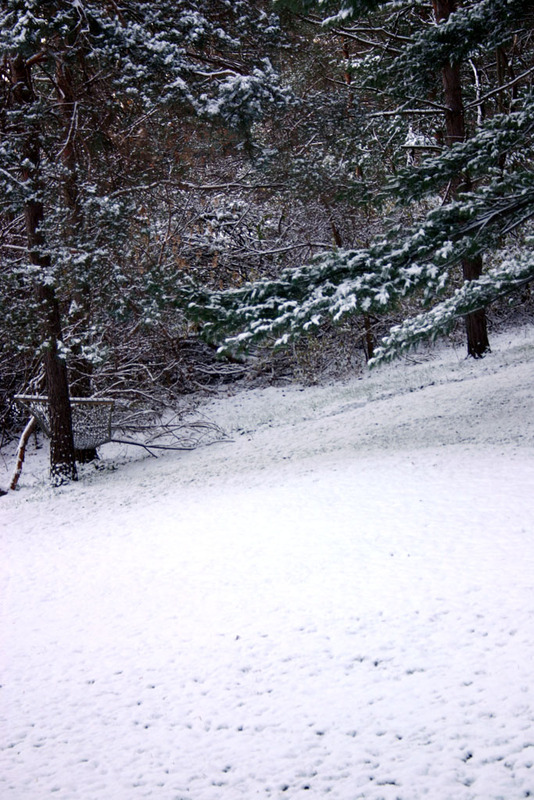 Yesterday morning was a small warning of snow to come. Last night was much stronger - I had trouble seeing the road by the airport at one point, but it seems to have slowed overnight. Time to get the snowblower ready. Today's Ithaca Journal Our Towns section visits the Crackerman of Etna, a baking business run by John and Beverly Bender of Etna. They've revived old-style crackers, and bake them in their house, a real cottage industry. If you want to try them but don't want to drive into Ithaca, Ludgate Farms carries the crackers, as well as cookies and biscuits. In Dryden Town Talk, Cathy Wakeman reports on the $250 grant the Dryden Youth Opportunity Fund donated to the Garden Club at Dryden Elementary School. The Garden Club is growing several different gardens, including one of potatoes that go to the Dryden Kitchen Cupboard to be given away. She also notes that the second annual Dryden Athletic Club Hall of Fame will be held on Saturday, November 13th, at 7pm in the Dryden High School gym. Briefly in Dryden reports that there will be a Women's Business Showcase on Sunday, November 21st from 11:00am to 4:00pm at the Dryden Veterans Memorial Home, and that the Dryden Youth Commission is looking for a new member. The Community Calendar and Today's Events (both print-only) list the Dryden Democrats' post-election gathering tonight at 7:30pm at the Dryden Town Hall, 65 East Main Street, Dryden (map). Democrats and Independents are welcome. At the county level, only four people attended a public hearing on the county budget last night, two of them municipal officials. On the Opinion Page, the Journal published a letter from me criticizing our state legislators and the Journal's coverage of them. Unfortunately, they trimmed my last line, I think dodging a bullet aimed squarely at them. Here's the original final paragraph, with the missing line in bold. The Syracuse Post-Standard published a series last month on borrowing through state authorities that the leadership uses to reward members loyal to them. More than $30 million of that spending landed in Tompkins County. I haven't seen a word about that here. Last time they trimmed a letter of mine, I thought they made it stronger. This time I wonder about their ability to take criticism. Trimming that sentence makes it sound like that $30 million of borrowed money might be a good thing, which is pretty definitely not what I meant. Fortunately, I have my own media outlet! County health officials distributed 1500 doses of flu vaccine yesterday at the Armory on Hanshaw Road, and are waiting for another 350 doses from the state. Tompkins County's prescription drug discount card will be arriving in January 2005, giving residents who don't have other prescription drug coverage access to lower prices. The Journal reports on Veterans Day activities, including one that the Dryden Veterans Memorial Home will be holding today at 11am on the Dryden Village Green. New York is home to 1.2 million veterans. If you know any of them, take a moment today. Seek them out. Let them know how much you appreciate their service to this country. Also on the opinion page, Jennifer Semo of Freeville suggests that "If you are that dissatisfied with our current leader, then thank the good Lord that you live in a country where you are free to leave at any time." Democrats and sympathetic independents met last night at the Dryden Town Hall to discuss the 2004 election, looking over how well we'd done locally while contemplating the growing divide among Americans and talking about how to communicate with people on the other side of that divide. Democrats and independents listen while County Legislator Martha Robertson talks about small-group conclusions. I spoke briefly about how we had done this year and the many elections (Village Trustees, Village Mayor, Town Board, Town Supervisor, Town Highway Superintendent, County Legislature, County District Attorney) coming up next year, and County Legislators Martha Robertson and Mike Lane spoke about the work that had gone into this year and the challenges to come in next year's elections. After the speeches, we broke into smaller groups to talk about what was on our minds, from national politics to the local scene. I was pleased to find a lot of positive thoughts amid the frustrations of the last elections, people looking for ways to connect better with our community and with others around the country. There was clearly a general recognition that we can make a positive difference even in times when the government is not of our party or our liking. 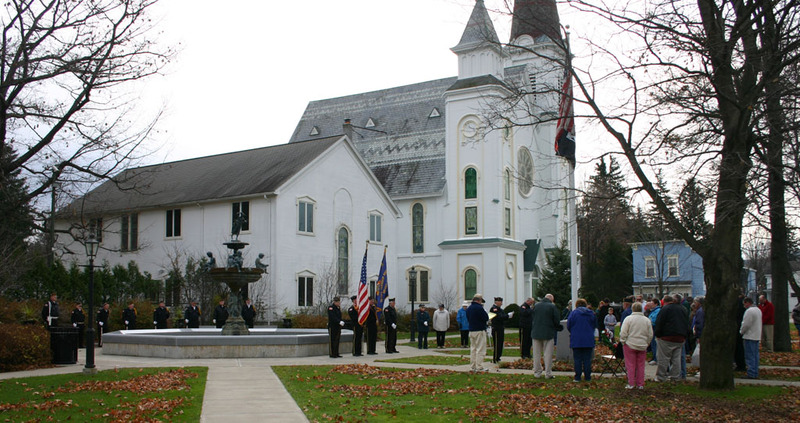 The Dryden Veterans Memorial Home held their Veterans Day observance at the Dryden Village Green today. A crowd of people turned out. It was hard to hear through the traffic, especially trucks, passing by, but the crowd stayed at attention. Veterans Day ceremony, Dryden Village Green. The ceremony concluded with a bugler playing 'Taps' and the firing of a salute. I've posted a collection of photos if you'd like to see more of the ceremony. 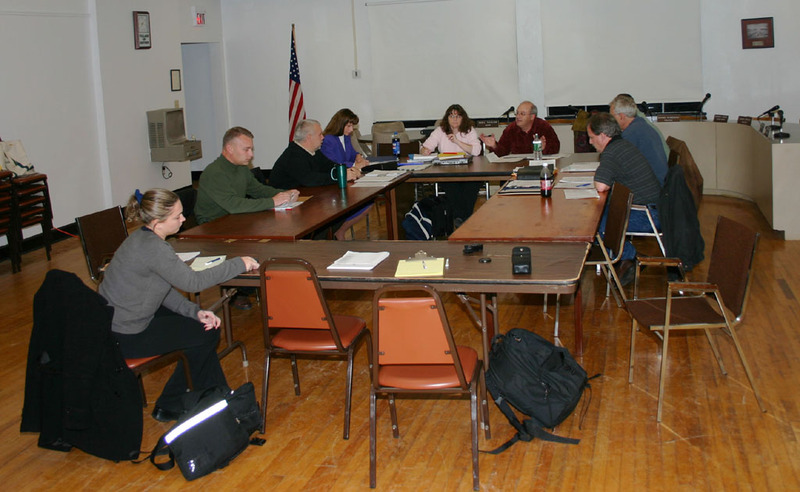 The Ithaca Journal reports this morning on last night's Town Board meeting, focusing on board members' growing concern with the reponse times of the Etna Fire Company. The board approved contracts for other departments, but not for Etna. The article also notes the appointment of a consultant for the Freeville-Dryden trail. A Lower Creek Road resident has been charged with harassing a TCAT bus driver. At the county level, the Ithaca Airport has hired a consultant to help find a carrier to supplement US Airways, which keeps floating in and out of bankruptcy. Up in Syracuse, the Metropolitan Development Agency has found its gathering of professionals under 40 to talk about keeping people in Central New York vastly oversubscribed. On the editorial page, the Journal wonders how to connect the Ithaca school board with its thoroughly diverse constituents. Also, I forgot to mention a piece yesterday that may be interest to Dryden readers. Caroline Supervisor Don Barber writes about the need for more police protection in rural areas of the county. Dryden Middle School's production of The Pirates of Penzance is in its last week of rehearsals, getting ready for performances next Thursday, Friday, and Saturday. Rehearsing The Pirates of Penzance at Dryden Middle School. Here's the press release, with many more details about the play and the production. 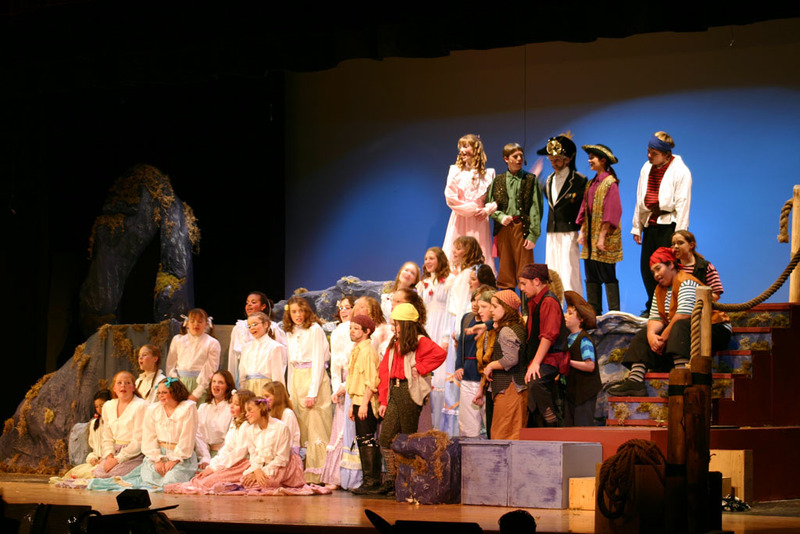 Dryden, NY — November 12 — Dryden Middle Schoolers promise to swash your buckles with an over-the-top rendition of Gilbert and Sullivan's Pirates of Penzance to be performed November 18, 19, and 20 beginning each night at 7:00 at the Dryden Middle School/High School auditorium. The Pirates of Penzance opened in New York City in December 1879. On December 10, Sullivan had written a letter to his mother about the new opera. "I think it will be a great success, for it is exquisitely funny and the music is strikingly tuneful and catching." The Pirates of Penzance was an immediate hit. Today it is one of the most popular and enduring works of musical theater. The plot of The Pirates of Penzance centers on the dilemma of young Frederic who, as a child, was apprenticed in error to a band of tenderhearted pirates until his 21st birthday. Frederic knows piracy is morally wrong, and so upon completing his 21st year rejoices that he has fulfilled his pirate service and is free to return to respectable society. But since Fred was born in leap year on February 29, he is bound to remain a pirate until his 21st birthday, a day far into the future. Helping Frederic to deal with his unusual dilemma are the brash Pirate King, Ruth, Frederic's nurse, lovely Mabel and her 22 unwed sisters, and the pompous Major General Stanley. In the Dryden Middle School production, Carl Beno plays Frederic and Sarah Becker plays Mabel. Thena Gitlin is Ruth. The Pirate King is played by Alyssa Morgan. The Major General is Lochlan Cahoon. Dryden Middle School actors are fortunate to have a number of theater professionals working with them on the production of Pirates. Joey Steinhagen directs the show. He has been teaching, acting in, and directing theatre for young people in this area for more than ten years. Most recently, he directed the Dryden High School production of Shakespeare's Romeo and Juliet. Steinhagen has been the Education Coordinator for the Hangar Theatre and the Supervisor of the Center for the Expressive Arts at the Ithaca Youth Bureau. Erica Steinhagen is Assistant Director of the middle school production. She has appeared in many productions on the Ithaca stage, at the Hangar Theatre and as a member of the Kitchen Theater Company, Greg McQuade is the show�s musical director. He has been a Music teacher for twenty-five years. He has worked on local productions of Guys and Dolls, Fiddler on the Roof, Bye Bye Birdie, The Sound of Music, and others. Kevin Crewell choreographed Pirates. Crewell is a professional actor, singer, and choreographer in New York City. Tickets are $4 for students and seniors, $6 for all others. The tickets can be purchased at the door or in advance at Hill Drug in Dryden. I'll try to get some pictures of the final version too! Today's Ithaca Journal includes an article by John Marcham on the history of the Lehigh Valley's Auburn Division, giving a brief overview of many lines, including the ones that crisscrossed Dryden. The History Center of Tompkins County has just published a book on the subject, with lots of pictures. "Either people are numb by the tax increases of the last three years or resigned to the fact we are doing the best job we can," he said." Martha Robertson, who voted against an earlier version of the budget, says she feels "more comfortable right now than I did before," though "There are a lot of things that are not being funded that need more resources, but everything is a compromise." On the opinion page, today's Darts & Laurels has two darts from Dryden. Kitty Totman of Freeville sends a dart to "the person who discarded his or her elderly family pet dog in the cold damp weather last week so it would have to fend for itself or die," while Dawn Potter of the Varna Community Association sends a dart to "the person or group who took the 9-foot outdoor lighted Halloween arch decoration from the Varna Community Center." There's also a letter from Maureen Brull of Dryden, an independent upset that a Republican voted for Bush because "It's better than having a First Lady who spreads ketchup all over everything." I've been meaning to post the Town Budget for most of this week, but have had problems scanning and converting it. Here, finally, if you're interested, is the Town of Dryden budget for 2005. Back in January, I stopped by the Varna Volunteer Fire Company to talk about finances, but also got to see a lot of their equipment. The cutters, spreaders, and rams for getting into damaged vehicles were resting quietly then. They got a workout today as volunteers learned more about how to extract people from cars. 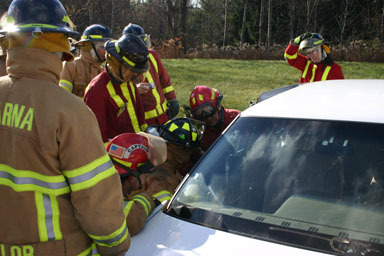 Cutting into a car during extrication training. Using the ram to break into a car. Rescue truck 1943 and air hoses, with a portable compressor at right. I was running between appointments, so didn't get to spend much time there, but Chief Roy Rizzo explained that the portable compressor could power the tools if there were two vehicles separated by more than the length of the hoses. The volunteers were getting training for a variety of different situations, including accidents where they might have to use tools creatively on multiple vehicles. Update: Oliver Habicht has posted a lot more pictures of the training. This week's Dryden Courier leads with a Victorian Festival that businesses in the Village of Dryden will be sponsoring on Friday, December 3rd. Nineteen businesses have come together in the past three weeks to do this. Businesses will have open houses and specials. 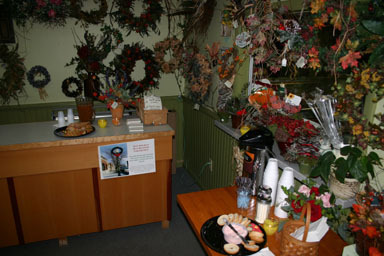 There will be performances by the high school band and caroling, as well as the Village's tree-lighting ceremony. An open party for children will be held at the Neptune Hose Company, and there will be a prize drawing as well. Back to Basics will be roasting chestnuts. The Courier also looks at the Dryden Central School District's hiring of an enengy consultant, a benefit held just across the town line in McLean, and Tompkins County's votes last week. The sports section features a picture of the Dryden Varsity Girls' Swimming team, coverage of the Dryden Girls' Volleyball team's winning a Class B championship, and general coverage of wrestling in the area. A Community Directory comes with this week's issues, providing things like municipal phone numbers and elected officials' contact information. One thing they missed - Dryden is no longer in Maurice Hinchey's district, but rather in Sherwood Boehlert's district. The only mention I can find of Dryden in today's Ithaca Journal comes in an editorial congratulating the Dryden boys' soccer team for winning a sectional championship November 6th. There's also a piece from Ithaca City School District Superintendent Judith Pastel on ICSD redistricting. At the state level, the Journal has a number of articles and editorials, though I notice that none of them mention the names of Dryden's legislators, Barbara Lifton and James Seward. In news, the Journal runs a Gannett News Service piece on reform in the returning session of the legislature. Another editorial examines the prospects of the legislature setting aside stipends in favor of an across-the-board raise. Jay Gallager looks at possible power struggles should Governor Pataki leave New York for an appointed post in Washington. The SPCA, which is based in Dryden, offers advice for keeping pets safe in winter. This morning's Ithaca Journal reports that the thorny issue of building a new jail may cause large problems for the budget. While no one, including the Journal's editorial, is happy with the New York State Commission of Corrections insistence that they build an expensive 136-bed jail, the question of what to do in the face of a bureaucracy that insists on having its own way is complicated. The Journal article shows the same divide between Dryden's legislators that came up at last Thursday's Town Board meeting. County Legislator Martha Robertson wants to halt $600,000 in design costs for next year, accepting the state's likely removal of variances and the cost of boarding out. In her view, "We can always decide later to build it." County Legislator Mike Lane is concerned that rejecting it "by refusing to approve the next step ... is likely to be taken as a very negative response at the state level." Lane supports continuing with the design process. There's also an article on a fatal collision in Danby that includes a sidebar of this year's accidents, including several in Dryden. Today's Ithaca Journal has lots of news about McLean, a hamlet that crosses the Groton/Dryden town line. McLean residents are working on new activities for youth, preferably run by teens themselves. There's also an article on Turtle Dreams, a bed and breakfast that's working on creating Turtle Village, which will do agritourism. Briefly in Dryden lists a Women's Business Showcase to be held November 21st at the Dryden Veterans Memorial Home, as well as openings on the Town of Dryden's Conservation Board, Youth Commission, and Zoning Board of Appeals. There was a complicated-sounding DWI arrest on Sunday on Quarry Road. The county budget failed last night in a 7-7 vote. The legislature voted to remove the spending on the jail from the budget 8-6, but couldn't pass the budget with a tie vote. County Legislator Martha Robertson voted to remove the jail and approve the budget, but the article doesn't contain a detailed breakdown of votes. The Journal reports that active farms can request to join agricultural districts this month in Tompkins County. On the opinion page, Calvin Croll of Dryden reminds a previous letter writer to the Journal that the obscenity used in a Doonesbury cartoon was a direct quote of Vice President Cheney, saying "If the vice president is willing to say something so offensive in public to one of his critics, a comic strip should very well offer a parody of his ridiculous behavior." While I'm grateful that there haven't been many accidents inside Dryden lately, there seem to be more and more nearby. Yesterday, Dryden rescue workers were among those responding to tractor-trailer crash on Route 13 in Cortland that left one of the victims' vehicles buried under tons of salt. At the county level, the jail project remains a possibility after Tuesday's 7-7 deadlock on the vote. The Journal provides a list this time of who voted for and against the budget. Among legislators representing Dryden, Martha Robertson voted for it, while Mike Lane and George Totman voted against it. On the opinion page, Assemblywoman Barbara Lifton writes a response to my letter earlier this month criticizing her and Senator Jim Seward for being so quiet on issues of reform and the Journal for doing so little reporting on it. Unfortunately, I find this column depressing for two reasons. First, it directly echoes a letter I got from her earlier this month, which didn't particularly answer the questions I had raised in my initial two letters. Second, Lifton happily points out the reforms she has supported - largely to do with the budget (which Pataki vetoed this week) and some of the Brennan Center's proposed reforms - without addressing some of the hard questions I raised. In my letter to her office, I asked about her earlier unwillingness to challenge Sheldon Silver on TCAT structure changes, and my letter to the Journal mentioned the borrowed slush funds that the leadership uses to reward members. I'd especially like to see a reply on that. The only time she directly mentions the leadership is when she says "I am pleased Speaker Silver has convened an Assembly task force to consider all the reform proposals." Will Speaker Silver be delighted to give up enough of his power to make the legislature function as a legislature, or will he give up just enough to make the news cameras go away? I'm afraid my guess is the latter. I think what frustrates me most is that Lifton's answers give me no sense at all that she's interested in making New York's government work like the governments we hear about in civics classes. There is little sign here that she sees a future in which the leadership manages the chamber rather than telling it what to do. Redistricting seems fundamental to thawing New York politics, and I don't see enthusiasm for that here. Maybe we'll see a similar reply from Senator Seward. I'll be curious, but I can't say I'm counting on so much as hearing from him on this issue. He's a member of the Senate Majority Task Force on Reform, but so is every other Republican Senator. Reform did claim an election victory nearby, despite the best efforts of those who draw the districts. David Valesky defeated Republican incumbent Nancy Larraine Hoffman for a State Senate seat near Syracuse. Hoffman had supported reform when she was a minority Democrat in the Senate, switched parties to the Republicans and dropped reform, and lost in a three-way race where reform might actually have been the deciding factor. Although the Town of Dryden notices page still shows the October 28th meeting of the Planning Board, I'm pretty sure that tonight is the Planning Board's November meeting, the 3rd Thursday of the month, at 7:30pm at the Dryden Town Hall (map). Looking over past articles, I seem not to have reported on the October 28th meeting, so here's a brief description. The board gave initial approval to a subdivision plan from Joan Portzline affecting property along Wood Road between Etna and Sheldon Roads. They also looked over stormwater management plans for a development to be constructed off Yellow Barn Road. The Planning Board definitely wants to move forward with the Comprehensive Plan, hoping to have public hearings on it early next year, and started going through a list of possible changes proposed by board member David Weinstein. The agriculture part of the plan remains the big question, and the group of farmers working on changes to that section was just getting started. An interesting tidbit about Dryden's recently re-elected congressman just came across my radar. Blogger Joshua Micah Marshall has been encouraging readers to contact their Republican congressmen about how they voted on modifying their rule that House leaders can't serve when under indictment, a move plainly mean to keep Rep. Tom DeLay (D-TX) as majority leader from losing his job if he's indicted for funneling illegal campaign donations to Texas state legislature candidates. The Dryden connection? Apparently Sherwood Boehlert has "a policy of only discussing his position on the DeLay Rule in letters to constituents." I guess I'll have to write him. Update: The Syracuse Post-Standard reports that Boehlert wasn't at the meeting, but supported the move. There's not much directly about Dryden in today's Ithaca Journal, but there's plenty about issues that affect Dryden. They've published a list of TC3 students receiving scholarships, including several from Freeville and Dryden. Negotiations between TCAT and its unions, required for the transition to a non-profit organization, seem to keep hitting snags. This all has to sort out by January 1st for the transition to proceed smoothly. Sam Walcott, the driver of a pickup truck buried under salt yesterday between Dryden and Cortland, seems to be fine. The state Assembly and Senate met briefly this week, choosing their leaders (the same ones). An Assembly steering committee met privately about how to reform their chamber, while the Senate held a press conference about reform. The Senate also voted to repeal the state's taking of traffic fine money from municipalities, though the article doesn't make clear if this is also supported by the Assembly or the Governor. On the opinion page, the Journal urges county legislators to settle the jail issue and get on to other business, and avoid an Albany-like stalemate. "The state Legislature has many good and decent people in its ranks, including those who represent us from Tompkins County. But every legislator votes at the start of each legislative session on the rules that permit these outrageous practices to persist. We have to demand that they fight for fundamental change, severely limiting the powers of their leaders and increasing the opportunities for individual legislators, the minority parties and the public to play real roles in the shaping of public policy." While a guest column doesn't provide enough space to dive into the details, I find Dullea's proposals much more likely to make New York run in a vaguely democratic fashion again than Lifton's proposals yesterday. I ran across this while looking to find out what the New York State Senate had accomplished at its press conference yesterday, and to see how much progress New York State Senator Jim Seward had made in the Senate Majority Task Force on Reform, which I had challenged him about at a Town Hall in Dryden in October. "I became the Majority Leader 10 years ago by promising to reform the way the Senate operates and, with the help and support of the Conference, I delivered those reforms. Now is the time to take a close look and seek input on how we can not only update and improve the legislative process, but also to review other areas of state government that can be changed to increase responsiveness and accountability." Toward the conclusion, in "Next Steps", the report continues its ever so happy tone: "This report aims at setting out clearly the vast record of accomplishment so far, and serve as the basis for continued discussion." I'll have to go through and analyze the details of this report to see how much of the reform they've described actually became law, and what effect it's had, but the report certainly doesn't make it sound like this committee has much understanding of how broken their institution is. Triumphalist defensiveness and pointing to other people's problems are strange to watch. It's hard for me to believe that they held a press conference about this document. It's certainly always good to look at the past, but releasing this rosy view of the past before making clear the steps they plan to take to fix the disasters of the present doesn't give me much confidence that they actually want to accomplish anything. The Albany Times-Union has more. There are two Laurels in today's Journal about the flu clinic that Tompkins County held at the Hanshaw Road Armory on November 10th. Joan Hogan of Trumansburg thanks Alice Cole of the county health department for the clinic, while Cole thanks a number of groups for their help, including the Dryden Fire Department, the armory staff, and the Tompkins County Sheriff's Office. Cole also has a guest column on dealing with the flu vaccine shortage. There isn't much news specifically about Dryden, but Dryden is mentioned in two very different articles. An article about the disappearance of the 'Collegetown Creeper' suspect and efforts to capture him mentions "the recent capture of Mao Sheng Lin, who skipped town before trial for his alleged role in the armed robbery last November at Dryden's Song Tao Chinese Restaurant." "I remember moving to Tompkins County 20 years ago from the San Francisco Bay area. The darkness of that first winter seemed to close in upon me. I grew quite depressed. One day as I was out driving in November -- I believe it was on Irish Settlement Road in Dryden ... I looked up to the gray hills. Suddenly the Biblical phrase, 'the little hills rejoice on every side' (from the Book of Psalms) came to my thought. Somehow, a key turned inside me with that thought. I looked again at those hills. What had seemed drab and dark a moment ago now seemed lovely in its own way -- large stretches of brown and gray with chunks of the dark green conifers here and there. The quiet of November had replaced the brief business of October, preparing us for the coming of winter, a time of rest, of deepening and rooting." I keep finding beautiful places in Dryden, and certainly agree that Irish Settlement Road has views that bring rejoicing to mind. I was very impressed last night with Dryden Middle School's production of the "Pirates of Penzance". I only got to see a few minutes of it (I'd driven up from Washington, DC earlier in the day, and can't make it tonight), but what I saw was amazing. I can't manage to speak the "Model of a Modern Major General" song, so seeing middle schoolers taking it on and succeeding brilliantly was fantastic. A "Modern Major General" at The Pirates of Penzance performance at Dryden Middle School. 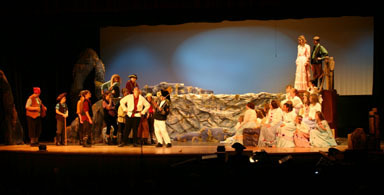 More of The Pirates of Penzance performance at Dryden Middle School. The show's final performance is tonight at 7:00pm at the Dryden Middle School/High School auditorium. Tracey and I and some friends explored the Village of Dryden a bit, taking advantage of open houses at Wildflowers and Arnold's Flowers. 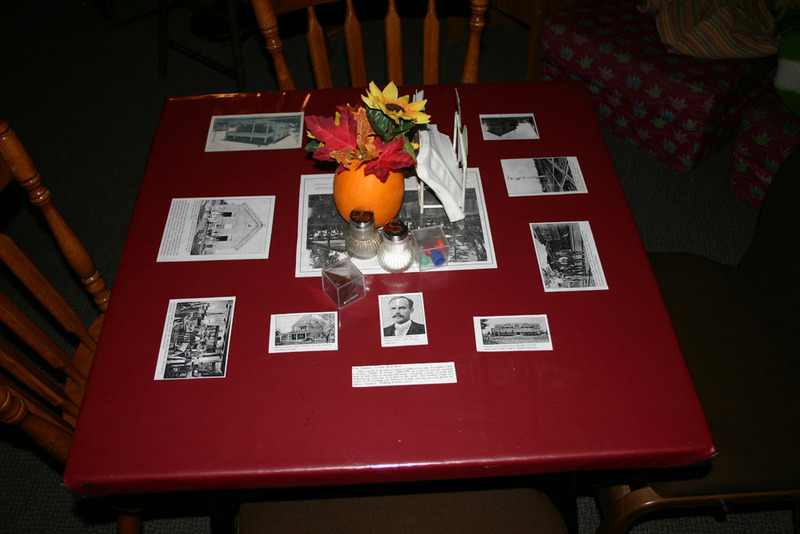 We started at Googer's Coffee Shop, where I enjoyed a half moon cookie (my usual there) and was happy to find all kinds of historical pictures and information in the table settings, as well as on the walls. 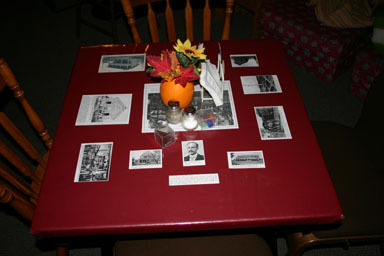 Tables in back room of Googer's Coffee Shop. 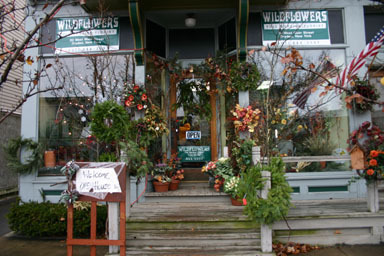 After Googer's, we went next door to Wildflowers, which had more fine cookies and coffee from Googer's as part of their open house. Wildflowers, in the Village of Dryden. After enjoying Wildflowers' selection, we went across the street to Arnold's Flowers, which was also having an open house. 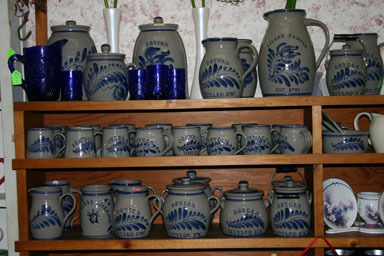 They had some ceramic pots that say Dryden, Freeville, and Etna. 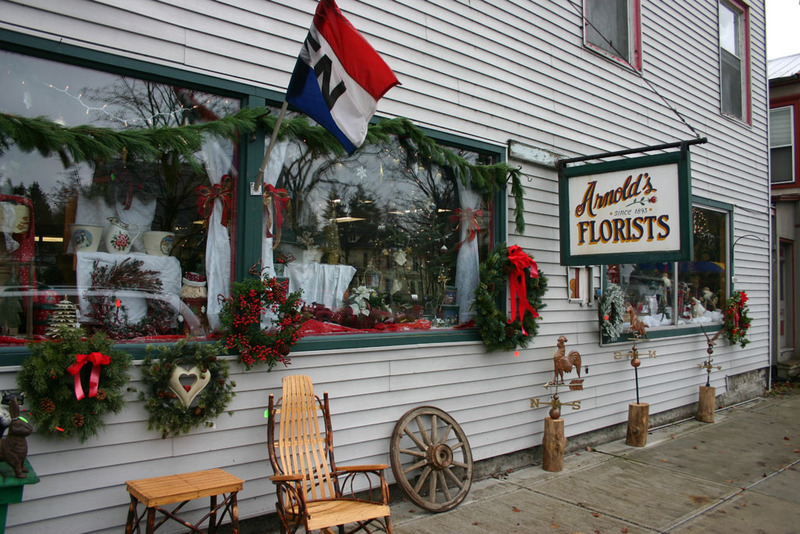 Arnold's Flowers, Village of Dryden. 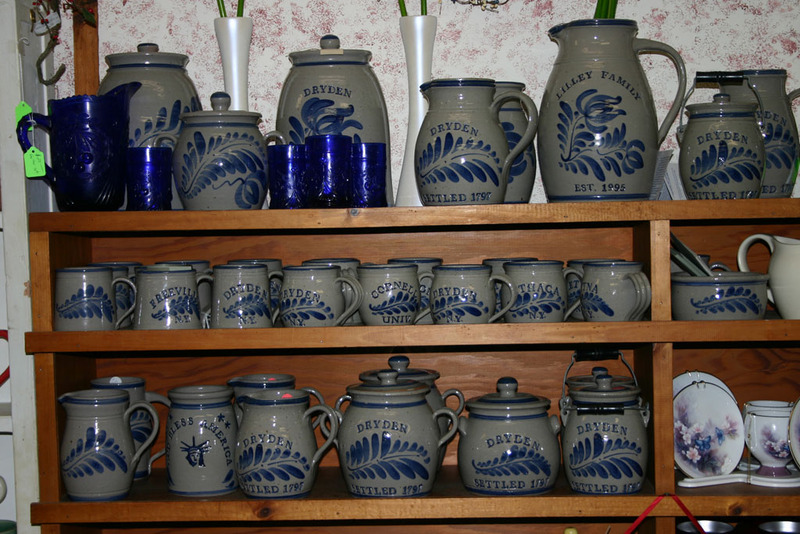 Ceramics at Arnold's Flowers, Village of Dryden. Finally, we stopped at the Dryden Liquor Store, and then came home. Walking around was a nice way to spend even a gloomy Saturday afternoon. This week's Dryden Courier is stuffed full of Dryden news. 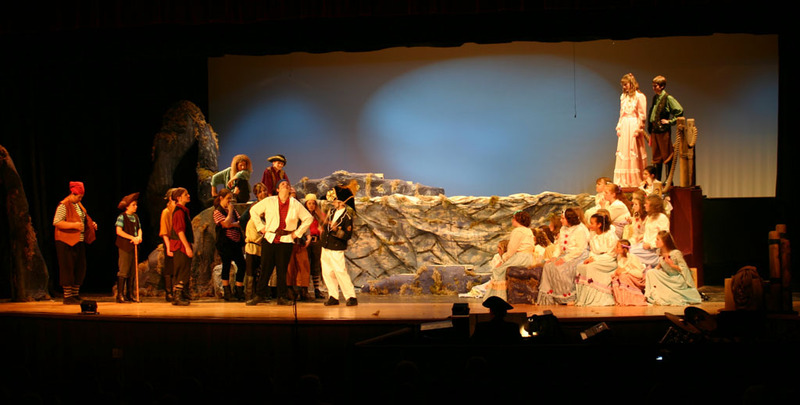 The front page leads with coverage of Dryden Middle School's presentation of The Pirates of Penzance, including both a picture and a story on the musical and its production. "They just have nobody to respond some days... They have a $100,000 contract with the Town of Dryden that should be for fire protection and we don't see that as happening." Stelick doesn't see this as a problem unique to Etna, but rather as the result of a long-term volunteer drought that's hit Etna first. The article mentions the high costs of paid fire protection and the possibility of hybrids, which combine volunteer and paid firefighters much the way Dryden Ambulance does. The article notes that "Etna fire chief Tom Lobdell did not respond to phone calls," and Stelick seems to be the sole source for the article. Inside the paper, writer Tony Hall talks with veterans at the Veterans' Day observance held November 11th. There's also a piece on the welcoming party for new Dryden Recreation Director Jennifer Staton that was held this past Wednesday, which talks about her background as assistant coordinator in Lynchburg, Virginia. There is also a letter to the editor from Dryden school bus driver Becky Colbert asking drivers to be more considerate of school buses on Route 13 - "in a three day period, I had fifteen cars pass through my red lights." An article on a Cornell symposium looks at how climate change might affect local farmers. In sports, the Courier briefly looks at Dryden Girls' Basketball in an article looking at the sport in the area generally, and a note on the Dryden Boys' Soccer team's closing loss in the state tournament. There's also a piece on the November 13th inductions into the Dryden Athletic Club Hall of Fame, including Bobbi Lynn Hamilton, John Snyder, Paul "Buddy" Lang, Bill Finnerty, Sr., Doug Smith, Kenneth T. Brown, Jr., Deb Prignon Tvaroha, Lee Stuttle, and Gloria Zirbel. I didn't expect very much when I wrote earlier about the Senate Majority Task Force on Reform's "Making Government Work: A Preliminary Report of the Senate Task Force on Government Reform" (65KB PDF), but I'm afraid that actually reading the report proved even more disappointing than I'd thought possible. The Senate Task Force on Government Reform not only will examine reforms of the legislative process, but also will study additional aspects of government dysfunction. Twice each year, the Senate releases detailed expenditure reports to allow the public to track spending by Senate member and office. That's all the legislative reform substance I can find here, and it's not very much. The document does talk about conference committees, which would be great if they weren't called by the leadership, and Bruno's pet subject of a unicameral legislature also appears. There's no discussion whatsoever of the control the Majority Leader has over the process, members, and spending of the Senate, no mention of the borrowed slush funds he can allocate to members who please him, and no mention of the gerrymandering that keeps incumbents mostly in place. An optimistic history of reform in the Senate since 1985, starting with a proposal by current Majority Leader Bruno. In addition to late budgets, critics of New York state government have focused on other aspects of legislative and government operations. Notably, one recent study analyzed the role of Senate and Assembly committees in reshaping and deliberating legislative issues prior to their moving to the floor for enactment. This token mention of the Brennan Center report is about the only thing in this report that so much as suggests interest in changing how the Senate actually operates. Calling this a sham report is far too kind. It's an extended excuse for doing nothing as usual. A preliminary report that meant something might have actually examined how the Senate operates, what might need change, and how those changes would interact with other parts of state government. Instead, it's a cheerful list of how so much has already been done, no matter how trivial the result. It doesn't give me much reason to believe Senator Seward's claim at Dryden Village Hall last month that "the word has reached the capital loud and clear." Today's Ithaca Journal has a picture of children packing gifts at the Bethel Grove Bible Church for the Operation Christmas Child program of Samaritan's Purse. An Etna resident, Susan Morse, and her dogs Kiss and Whisper, are noted in K-9 news qualifying for and completing dog obedience titles. Near Dryden, the Journal reports on the progress of Caroline's planning process, which like Dryden's includes future land use, concern about preserving agriculture, encouraging small business, improving housing conditions, and creating trails. There's a piece on how enthusiasm for reform in Albany is largely public relations for resistance to reform in Albany, citing the Senate report I discussed yesterday. On the opinion page, the Journal praises the coming of a Tompkins County prescription discount card for the uninsured, while Jay Gallagher warns that creating a unicameral legislature would be a mistake for upstate. Gallagher cites Assembly Democrat Richard Brodsky as supporting it, but it's worth noting that Senate Majority Leader Joe Bruno also keeps talking about it. There's lots of news about Dryden in today's Journal. As they alluded on Saturday, the Journal reports that robbery suspect Mao Sheng Lin has been returned from Houston to Ithaca to face trial for a November 2003 robbery at the Song Tao restaurant in the Village of Dryden. Lin posted a $200,000 bond earlier this year and then disappeared. Two other suspects have already been convicted in the robbery. Varna Auto Service leads an article on the unclear status of cleanups at gas stations in the county, with the Journal publishing this excerpt of a DEC report on the Varna station: "Unknown Quantity Spilled: Yes. Cause of Spill: Unknown. Resource affected: Groundwater." The Journal discusses a spill in Fall Creek in much more detail. The County Health Report includes a number of Dryden entries. State Comptroller Hevesi continues to audit state authorities, finding all kinds of problems at the Hudson River-Black River Regulating District. It's far from Dryden, but an unfortunate piece of a system that often gets used as a political piggy bank. Other authorities have borrowed money spent in Tompkins County and Dryden for reasons far from their original purpose. Area residents still need to support their fine, albeit pricey, facility. Perhaps the county can help support it by subsidizing the costs. It just doesn't take an expensive consultant to figure it out, especially if the result is not supported. This morning's Ithaca Journal is pretty well packed with news about and surrounding Dryden. Cathy Wakeman's Town Talk column looks at Eagle Scout Christopher Ackley's project, rebuilding the east entrance on the Dryden Veterans Memorial Home. Wakeman also offers a preview of next Friday's Victorian Winter Festival, which will be held in the Village of Dryden from 3:00pm onward on December 3rd. Businesses will be having open houses at 3:00pm. Christmas carolers will start at 5:00pm, the Dryden Brass Band will play at 6:30pm, followed by Santa and a tree lighting, and Neptune Hose Company will have a community reception at 7:30pm. The next day, Southworth Library will have a Victorian concert at 7:00pm. It sounds like quite a set of events. The Dryden Briefs list continued openings on the Town of Dryden's Conservation Board, Youth Commission, and Zoning Board of Appeals. "Maybe we can use some of the water in the future if a water district was formed in Ellis Hollow. I know the wells are causing trouble there." Continuing from yesterday's story about the uncertain conclusions to gasoline spills, the Journal has a list of spills in the county today. Dryden spills include the previously mentioned Varna Auto Service one, as well as one at the Plantation Inn on Dryden Road, one at GTE (6 Freeville Road), two at the current Mobil station (51 North Street), Cornell University Turkey Farm (Turkey Hill Road), and one with no name given in the 1300 block of Dryden Road. On the edges of town, the Lab of Ornithology on Sapsucker Woods Road and a Cornell field on Hungerford Hill Road also reported spills. Cornell research fields in Freeville were among those contributing fifty tons of fresh produce to the Food Bank of the Southern Tier this year, giving them free food with very little transportation cost. In county news, there's an article about the future of the airport, which suggests "It's not your typical rural has-been airport." The Journal's editorial looks at highway safety issues in the county, suggesting that drivers "Allocate a reasonable time for travel and don't abandon common sense in order to save a minute or two. It could spell the difference between arriving a few minutes late or not arriving at all." A guest column by Kathryn Totman of McLean urges readers to be foster families for the SPCA, taking in dogs for periods ranging from a day to a few weeks. Istook, chairman of the Subcommittee on Transportation, Treasury and Independent Agencies, drastically reduced, or entirely excised, the transportation earmarks that those lawmakers were expecting to receive, making good on a little-noticed threat he issued in a letter last February. Istook's anti-Amtrak retribution hit several of the Republican majority's most vulnerable members, including Reps. Rob Simmons (R-Conn.) and Jim Gerlach (R-Pa.), two Northeastern centrists who won tight races, in part, by convincing constituents of their ability to bring home road money. The affected lawmakers did not learn of Istook's drastic action until last Saturday, when the bill was passed. Several of them contacted Republican leaders to inquire if they knew of Istook's punitive action and were told that party leaders were unaware that Istook was harming vulnerable members. In addition to Gerlach and Simmons, Reps. John McHugh (R-N.Y.) and Sherwood Boehlert (R-N.Y.) were said to be particularly outraged at Istook's actions, according several committee sources. Upon learning that his projects were cut, McHugh came close to physical blows with Istook, according to some accounts. Update, February 3, 2005: Istook just lost the chairmanship of the Appropriations subcommittee that let him cause all this trouble, in a collection of changes that appear aimed at quieting all disputes among Republicans. Istook denies that the Amtrak issue had anything to do with it. Thanks again to Josh Marshall for following the story. Both of them represent Dryden, and neither of them seem particularly enthusiastic about changing the ways their chambers operate. I'd like to see that change, so I've written them each a letter about a practice that seems to deviate pretty substantially from the way we teach civics students that government should operate. "Empty seat voting," or "fast roll call voting", lets legislators vote yes even when they aren't in the chamber. The Brennan Center report notes on page 31 that among professional legislatures, only New York's two chambers use the practice regularly. Pennsylvania permits it, but only uses it half the time, "never on significant legislation," while New Jersey permits it and only uses it in a limited number of cases. California, Illinois, Massachusetts, Michigan, Ohio, and Wisconsin don't use it. I've posted my letter to Lifton (69KB PDF) and my letter to Seward (68KB PDF). I'll also post any replies I get back, and evaluate whether they answered the question. The Federal Emergency Management Agency has agreed to pay Dryden $170,000 it was contesting, according to a press release from Congressman Sherwood Boehlert's office. FEMA had been unhappy with changes made to the Virgil Creek Stabilization project after their initial approval, but onsite meetings and a few months of conversation appear to have convinced them that the changes were improvements and that they were permitted by the terms of the agreement. After an article earlier this week that mentioned the uncertain status of a gas spill at Varna Auto Works, the Journal has an update that talks with the owners about the status of the cleanup. Varna Auto is investing over $50,000 to clean up gasoline spills created by "unused tanks previous owners had left in the ground." The Journal's editorial encourages readers to contact the paper with news, events, and comments, suggesting that "a daily newspaper works most efficiently when information flows both ways, between its staff and you." Today's Journal reports on Governor Pataki's apparently sustained veto of $325,000 in aid to TC3. The article left me wondering if the college aid was included in a list of vetoes the Senate couldn't override because the Assembly hadn't overridden it, but this Newsday article makes clear that it is. The $325,000 was for operating expenses, and the college has adjusted its budget. Pataki also vetoed $10.6 million of capital expenses for TC3, but the overrides on that haven't been attempted yet. There are three articles on issues in the county that affect Dryden. The Journal looks at recent car-truck collisions and finds the drivers of the cars to have been the cause. There's a piece describing the Home Energy Assistance Program (HEAP) and the aid it provides. Finally, Elia Kacapyr finds that Tompkins County's economy grew strongly in October. 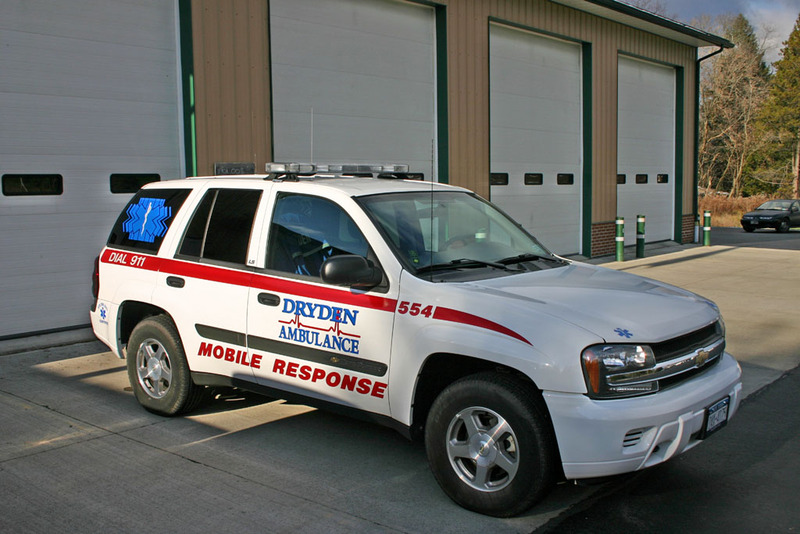 Dryden Ambulance held a dedication ceremony for its new Mobile Response Vehicle and four new heart monitors at the Varna Fire Station yesterday. The new Mobile Response Vehicle. Clayton Bronson, Director of Operations, gave a presentation outlining the new equipment and plans for using it. He started by thanking the Town Board, the fire companies, and the boards of the fire companies for cooperating on this project. Bronson said that the ambulance company responds to about 1200 calls per year, possibly more this year, with staffing of 1.5 crews. 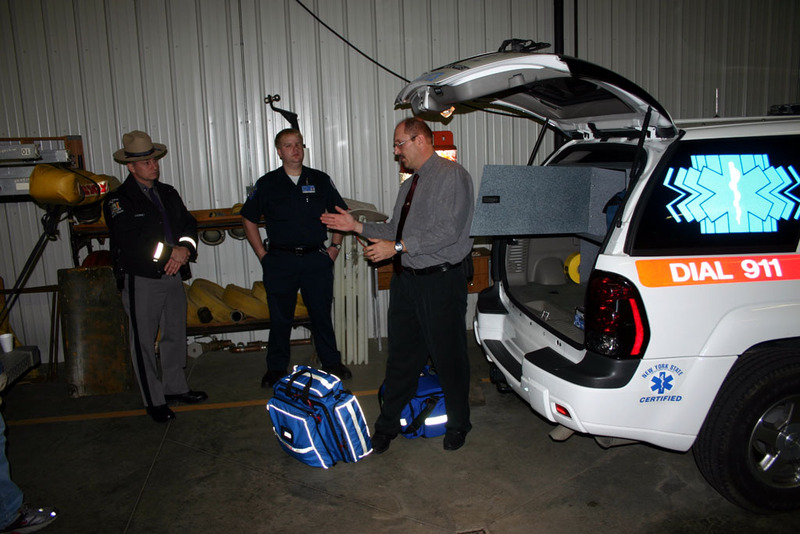 The Mobile Response Vehicle is designed to let the ambulance company cover the western end of town more effectively without the costs and staffing requirements of a full new ambulance. The vehicle was paid for out of existing funds for a new ambulance, and the company will be getting the new ambulance in January. They managed to squeeze the truck in on that budget by buying a used vehicle (11,000 miles) from Stafford Chevrolet and reusing demo parts for the interior of the truck. Clayton Bronson shows the first-response equipment in the new Mobile Response Vehicle. The vehicle carries packs of equipment for adult and pediatric emergencies, and has a ceramic heater on board to keep the drugs from getting too cold. It also carries a half backboard and a case of water. On weekdays, the new vehicle will 'float' on the western side of town, using the Etna and Varna fire stations as a base. The vehicle can provide first responder services on this side of town, or move further east if the ambulance service is called out elsewhere. It will be toned out with the Etna and Varna fire departments to provide additional rescue assistance to the fire companies. At night, the truck goes home with a driver who carries a pager. The company has this fully scheduled through December, except for Sunday nights, which they're working on. They have also been very happy with the volunteer driver turnout for the ambulances lately. After describing the vehicle, Bronson turned the floor over to Brian Brooks of Phillips Medical, maker of the new HeartStart monitors. 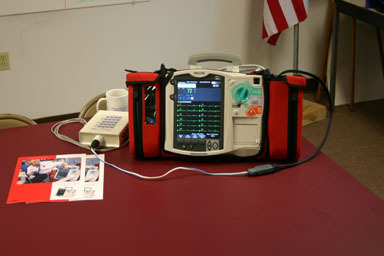 The monitors weigh 17 pounds, down from 27 pounds for their predecessors, and combine two kinds of monitors for basic and advanced cardiac emergencies, including defibrillation capabilities. The ambulance company has been using a demonstration unit for the past three months, and has now bought four of them at around $14,000 each, which sounds like a considerably better price than other area companies got. 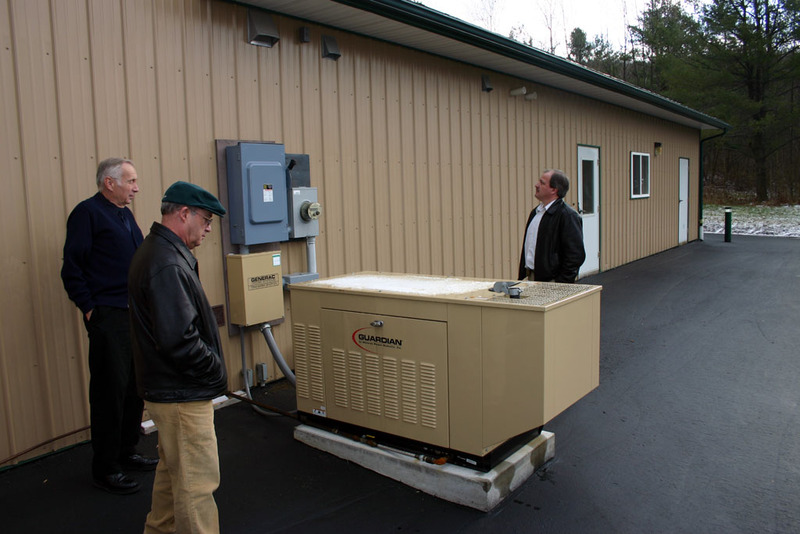 During the reception, Town Supervisor Steve Trumbull and Town Councilman Steve Stelick took the opportunity to see the generator the Varna Volunteer Fire Company had recently installed, one of several one-time expenditures in last year's budget. Firefighter Duane Testut, Supervisor Trumbull, and Councilman Stelick look over the new generator at the Varna Fire Station. Firefighter Duane Testut fired up the propane-fueled generator, and explained their capabilities. The storage tanks onsite hold two days' fuel, and the propane company will bring additional fuel in the event of an extended power outage. Varna Chief Roy Rizzo praised the generator as a major improvement, especially in situations like ice storms where the fire company is enormously busy and needs a base that works even when the power is out. I've posted more pictures of the morning event. "The purpose of this meeting is to approve an amendment to the labor agreement between the Town and Teamsters Local 317, and such other business as the board may deem necessary." It's been over three months since I last posted a piece of George Goodrich's The Centennial History of the Town of Dryden, 1797-1897 . There's been plenty of Dryden news to keep the days busy, and the chapters I haven't yet done are, naturally, the longest and most complicated ones. I plan to improve on my recent record. In this chapter, Goodrich looks at the political organization of Dryden, starting from its origins as part of the Town of Ulysses, through Dryden's becoming a separate political entityin 1803, and then through the list of men (yes, they're all men) who served as Town Supervisor, Town Clerk, and Justice of the Peace. I'm amazed by the 12.5% property tax rate in the first year taxes were charged here, though no one lived in Dryden at the time. There are odd breaks in the tables for Town Supervisor and Justice of the Peace, as I'm trying to preserve the way Goodrich's original had it laid out. Those represent page breaks. There's a period from 1878-1884 when all of the Town Justices seem to have been named George or William. Suddenly, in 1885 and 1886, an Alviras and an Artemas join the list. Dryden seems to have used proceeds from its "gospel and school lot" (No. 29) more or less exclusively for education, "in accordance with the general spirit of the country, which, while liberally providing for public education in the common schools, declined to impose any compulsory tax upon the people directly or indirectly, for the support of sectarian or religious institutions." Isaiah Giles was apparently responsible in part for this. Town Clerk - Joel Hull. Assessors - John Ellis, Joel Hull, Peleg Ellis. Constable and Collector - Daniel Lacy. Poormasters - William Garrison, Philip S. Robertson. Commissioners of Highways - Lewis Fortner, Ezekiel Sanford, William Harned. Fence Viewers and Overseers of Highways - Amnah Peet, Ebenezer Clanson, David Foote, Joseph Schofield. Pound Master - John Montayney. It must have been a veritable paradise for office seekers in those days, for everyone could hold an office and still have offices to spare. We thus have before us the names of the men who for nearly a century have had the care and management of the political organism known as the "Town of Dryden." The only material change in the territorial extent of the township was made in 1887, when the easterly seven lots of the southern tier were set off and annexed to Caroline, for the reason that they were located much more conveniently to Slaterville as a business center than to any similar place within the Town of Dryden. 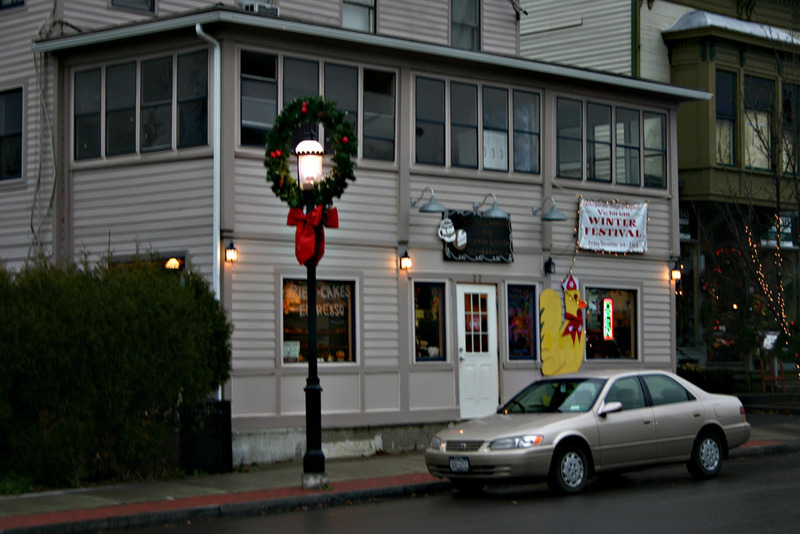 The town meetings were early held at different hotels in the town, subsequently more often at the Dryden Center House, until within a few years past, during which they have been held in election districts. The town was formerly divided into four, but now consists of six election districts. In the old times one of the duties of people at town meeting was to apportion the income derived from the gospel and school lot between the support of the churches and schools, the statute requiring that it should be annually distributed by the voice of the people at town meeting so that each should have some share. In accordance with this requirement it used to be a standing custom at every town meeting to pass a resolution that of the gospel and school funds "six cents be appropriated for the support of the gospel and that the balance be devoted to school purposes." This was done not from disregard for the welfare of the gospel, but was in accordance with the general spirit of the country, which, while liberally providing for public education in the common schools, declined to impose any compulsory tax upon the people directly or indirectly, for the support of sectarian or religious institutions. The gospel and school lot was for a long time rented and the rents applied annually as above stated, but subsequently the lot was sold and the proceeds, about eleven thousand dollars, now forms the town school fund, which is loaned by the supervisor on bonds and mortgages and the interest applied annually for the benefit of the common schools of the township. Goodrich, George B. The Centennial History of the Town of Dryden, 1797-1897 . Dryden: Dryden Herald Steam Printing House, 1898. Reprinted 1993 by the Dryden Historical Society. Pages 23-7. "guilt-prone protagonist in Dryden resident Margaret Laurenzen's first book, which was published three years ago with the help of twelve-year old illustrator Mathew Habalou, a Dryden intermediate school student." Laurenzen, who was 77 when the first book was published in 2000, has a sequel, Slinky Slithertail and the Talent Show, coming out in a few weeks and a third book coming this spring. The Courier also interviews John and Sondra Bromka, who will be performing as the Bells and Motley Consort at the Southworth Library's "Victorian Musical Celebration of Christmas Past." The article talks about the music and instruments the two will be using, as well as the library's other activities planned for this coming Friday and Saturday. The concert will be at 7:00pm at the Dryden Village Hall (map) on Saturday, December 4th. Oddly, an article about the county jail situation written by Dryden County Legislator Martha Robertson appears in the Ithaca Times but not in the Courier. "... became interested in lumber speculations in a small way, which prepared him for his future success upon a large scale in that line of business, first in Allegany county, and afterwards in Michigan, where he operated near Bay City one of the largest lumber mills in the country." While surfing around the Internet, I found a lot more information about that mill in Bay City, including a picture of the operation. It also discusses the court battles over his daughter's estate. The Ithaca Journal reports this morning (as I reported Thursday) that FEMA has decided to restore the $170,000 in funding they had removed because they claimed the project had changed since it was authorized. Residents of the southwestern corner of Dryden may want to attend a forum on redistricting elementary schools in the Ithaca City School District, which will be held at 7:00pm on Tuesday at the district's administration building.(map). The Monitor reports on a tire theft along Dryden-Harford road and a one-car accident on Caswell Road. There's another notice about adding farmland to agriculture districts in November, which is quickly running out. Attorney General (and likely candidate for governor) Eliot Spitzer is calling for an end to all lobbying gifts, another angle on the complex discussions of reforming Albany. [reform] either provides Silver with a) a convenient political cover to delay a vote on the death-penalty measure while he assesses how the issue plays (the Republican version) or b) a chance to hear what the public has to say about an important policy question (what the Democrats say). Will the hearings be shams? Maybe. But these days it's hard to be against the public speaking out. I have to agree with him on that last sentence, and hope the public will speak out on more issues. Today's Ithaca Journal provides an update on plans for the trail from the Village of Dryden to Freeville. Environmental Planner Debbie Gross talks about hiring a contractor and the early planning. Trail landowner Warren Van Pelt talks about his concerns, and contractor Rick Manning talks about the engineering challenges involved and the possibility of interpretive signs. To the west of Dryden, there were two accidents within an hour at the intersections of Route 13 and Warren Road and Route 13 and Brown Road. There were no fatalities, but one victim from the Brown Road accident was taken to Cayuga Medical Center. The Journal's editorial complains about the apprenticeship program the county legislature now requires contractors to support on projects of $1 million or more. RESOLVED, that this Town Board hereby approves the memorandum of understanding between the Town of Dryden and Teamsters local 317, and the Supervisor is hereby authorized to execute the same, subject to review by the Town Attorney. The section in italics was added over the course of the meeting. There was also a possible second resolution they held off bringing to a vote. Not a lot of detail here, and I need to find out quite what this actually means, but that's what happened, so far as I know right now.